You are here: Home / Relationship Healing / 5 steps to Uncovering Karmic Relationship Patterns! 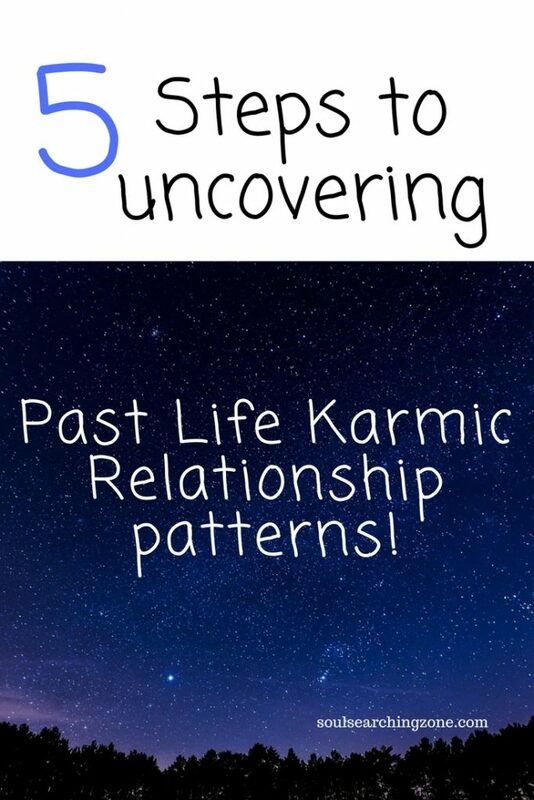 5 steps to Uncovering Karmic Relationship Patterns! Have you ever met a person that triggered you on every level possible? It could be someone you just met, or someone you have known your whole life. Chances are regardless of what you try to do to get away from this type of person, they just keep showing up in your life. Or maybe you feel magnetically drawn to them in some way, but are not su re why. If it is karmic related, you may have more than one type of person in your life that resembles the same personality type. There may be one type of person that you always seem to attract and can never seem to get away from. This is because of karmic themes. One example would be, if your soul reincarnated in this lifetime to resolve and balance a belief that you are dis-empowered or powerless, you may find that you are surrounded by dictators, people that seem to thrive by having power over others. This type of power is of course a false power driven by the ego, but when you are in the midst of it, it is easy to believe that you are powerless around people of this nature. Imagine now if you will, that your soul co-creates with other souls on the spiritual plane in order to experience the perfect scenario for your evolution. What do you think that co-creation might look like? This would be a contract between your soul and another soul to create a specific situation based on your soul lessons. Any soul that you have a soul contract with, would be considered a soulmate. Your greatest challenger is still a soulmate regardless of whether or not they play the role of the bad guy or the good guy in this lifetime. Understanding the concept of co-creation helps you to release the emotional triggers that bind you to that person out of fear, frustration, anger, guilt, shame or pain. Karma is known as the law of cause and effect. Another way to explain it is unbalanced energy or unfinished business. Or you reap what you sow. A karmic relationship can be either positive or negative. Most often a karmic relationship would mean that two souls are intertwined through past lives and soul contracts that have not yet been fully integrated into their soul. To integrate a soul lesson means to allow that experience to move you into higher levels of awareness and soul expansion. Your soul is always seeking expansion through contrast and duality. Step 1: Identifying Karmic Themes- A Karmic theme is a theme that has played out in your life from the very beginning. It is the way you have always felt, the way others make you feel, the type of people that have always been around you or the situations that seem to play themselves out like a broken record over and over again. This is also known as a spiritual lesson. Write down at least five reoccurring themes you have experienced throughout your life time. Note: (when you begin to resolve the energetic patterns from within you, you will no longer have the same lessons, but pay attention to the new ones that are coming forward.) The more awakened you are the faster you will begin to burn through karmic relationships, revealing and integrating more and more soul lessons and receiving the gifts in return! Step 2: Identifying relationship patterns– Take a moment to write out all the relationship patterns you have noticed in your life, up until this point. Example: Unappreciated, door mat, misunderstood, victimized, abused, bullied, scapegoated, used, unloved, not taken seriously etc…. Have you noticed a pattern of jealousy, anger, emotionally absent, neglect, taken for granted…….. Step 3: Uncovering Resistance– The easiest way to find your resistance to learning your soul lessons is to look at where you blame others or hold others accountable for the problems in your life. Take a moment to write down all the ways you blame others or even yourself for your relationship problems. Step 4: Shifting your perspective– Think of a person that you have always had an intense emotional reaction to. Shift your awareness into thinking of them as your teacher in this lifetime. Take a moment to write down all the lessons they are here to teach you. What are those lessons? What lessons do you feel you may have to teach them? Step 5: Open the gift– Take a moment to review everything you have written. Take in three deep breathes. Imagine now that you are viewing your karmic lessons and themes from a higher perspective. What is the gift that you will receive when you allow your lessons to be integrated into your soul? In what ways would your life change? How would you feel different? What gifts will you receive? Wonderful article. Very valuable information. I am looking forward to getting started on my list. Very inspiring and Blessing to come my way soon.